There’s nothing like those early days of setting up your own business. The days when you fully embrace ‘following your joy’ and jump in with such optimism and more than a little bit of naivety (which is probably a good thing or no-one might ever make the jump!). 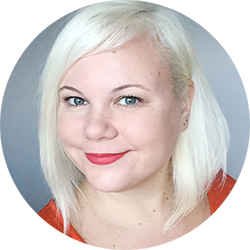 I’m sure you remember those days when you happily worked on your new website around the clock because you were so pumped about how amazing it'll be and how it would totally take your business to the next level. When you spent every waking minute thinking about the next step and hated it when you had to do something else, say clean the house once in a while, when all you wanted to do was twiddle with your new logo or learn more about SEO. Those heady days, that turn into the crazy early years, are some of the best (and some of the worst, but you take that as a given) times for a small business owner. You are finding your own voice and place in your market and you learn loads, so much sometimes that your head is spinning. Eventually, you find your groove and start feeling like an ‘established' business owner. And then something happens, the market changes, new people you don't recognise start making waves, new technologies and new marketing methods pop up faster than you can keep up. So you keep learning, you keep trying to keep up. At some point, all that new knowledge might start feeling like a weight on your shoulders. There’s so much you didn’t even know you didn’t know before, which means there’s still probably an infinity of stuff you’re yet to learn out there, and it can all feel a bit, well, intimidating. Was there a point when you started feeling like you were coming up short, like you’ll be found out? A time when you started doubting whether you know what you’re doing after all. I’m pretty sure everyone goes through that phase. The overload of information and varying opinions build up into a big ball of indecision, and you start dreading making any decisions about your business in the fear of it being the wrong decision. You might even start doubting your abilities to run a business. There may come a point, where your whole business, the same one that so inspired you at the beginning, turns into a big scary responsibility you feel you’re not equipped to deal with. Don’t worry, that sometimes happens to all of us. Pretty much everyone goes through periods of overwhelm, especially those of us who prefer to work on our own without a business partner to bounce ideas off of and put worries into perspective. When you feel like your business has taken on a life of its own, and you’d rather hide and ignore it all, it really helps to get back to basics. To start taking small actionable steps that will make you remember that it is you steering your business. You are able and capable of running this thing. Here are 10 things you can do right now in order to feel more in control again. Write down all your ideas and to-do’s and organise them into an annual calendar. Getting that stuff out of your head and into an actionable form will instantly make you feel like you are running things again. Do the same with your inbox. Reply to all the urgent message, develop a system for dealing with emails more efficiently, and signup for Unroll.me in order to clear your inbox of all the distractions. Shoot out a few emails to past clients to see how they are doing, ask a friend within your industry out for lunch or coffee so you can put each other's woes into perspective. Sometimes it’s reassuring to know that even though you might work in your PJ’s without seeing a soul for most of the time, you are connected to people who either benefit from what you do or understand what you’re going through. Not all Facebook groups and forums are created equally. While there might be a lot of valuable information in the ones you frequent, make sure the vibe and the active people resonate with you. Sometimes a fast-moving super active group can add to your stress rather than help you with your overwhelm. If you’re an introvert and a regular at an extrovert-heavy group, it’s no wonder you can start feeling like you’re not up to scratch! You have to acknowledge the fact that you move at a different speed, and find the people who match that. Whether you put together a styled photoshoot or even your own creative event, being in charge of something that completely fulfils your creative vision can be super invigorating and empowering. Often overwhelm stems from feeling like you have to adhere to someone else's standards or idea of creativity, so when you get to decide on all the elements (and people involved) on your own, you will feel completely on top of your creative game again. The most important role that a mentor has, is to be a safe place where you are able to say ‘I don’t know this’, and trust that you’ll be 100% supported and not judged. Your mentor will be able to offer you a different viewpoint on the problems your facing, support you with the practicalities of implementing things, and help you work on a strategy that propels you forward with confidence. You might have even skipped putting together a business plan altogether in the heady days of setting up your business, which would be an obvious cause for your overwhelm right now. But even if you do have one knocking about in a drawer somewhere, refreshing your business plan regularly will get you back on course and help you focus. A business plan you create solely for your own use can help spark new ideas, energise you, and provide you with actionable steps to move forward. Gold dust. There are so many amazingly fun idea-generation techniques around that can help you unlock all sorts of magical things that your brain has stored up. Utilise them! There’s no better feeling than coming up with an idea that sparks pure joy inside of you, or even solves multiple problems you’ve been struggling with at once. It’s so important to allow yourself enough time to recharge. Especially if you’re on the introverted side, you owe yourself that quiet time or else you know you’ll be useless. Don’t think of it as laziness, but rather a necessary practice that allows you to be at your best. One of the biggest causes of overwhelm is not know what your clients think. When you don’t know what they think, you automatically start fearing for the worst, which adds to your feelings of not being in control. So, ask them! Put in place a workflow for requesting feedback, do regular surveys, and always add a call to action at the bottom of your newsletters asking for your reader’s opinions on what you’ve just sent out. There's nothing better than to hear back from the people who value what you do, it really makes it all worthwhile. It’s fine, you don’t have to make a blog post about them, or even share them with anyone if that makes you feel uncomfortable. Just make a list for yourself of all the things you’ve overcome and achieved since you set up your business. I guarantee you’ll be surprised by how much you’ve learned and how many amazing things you’ve put out into the world. You did it. Own it. It’s your business and you’re in charge. 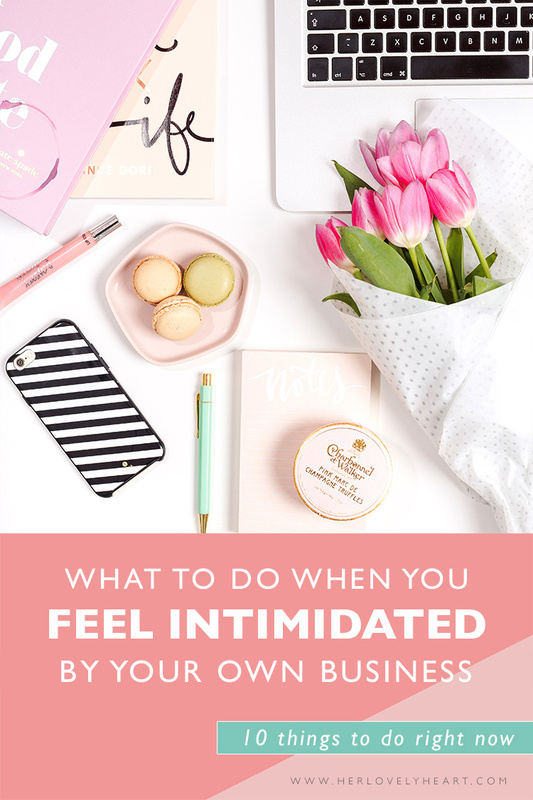 There’s no reason to feel inferior or intimidated. You’ve got this! I am in the process of launching an online Bridal Boutique and it has inspired me to keep pushing forward and enjoy the highs as well as the lows. Thank you thank you thank you ‘herlovelyheart.com’ – you have re-ignited my passion.